How much of our world do we miss? The butterflies, spiders, hummingbirds, and yes even the honey bee. Six legs, four wings and a never-ending drive season after season. As the Queen returns to egg laying in mid-January, the rest of the colony must also engage in their duties in support of the new brood (babies). 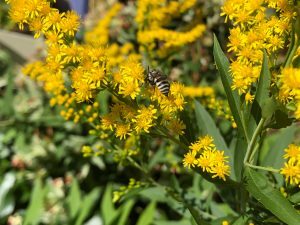 Have you seen the honey bees in your yard? Walked along a path to see them on plants or flowers? How about the plethora of bumble bees this season? The Queen Bumble Bee, a solitary insect, hibernates through the winter to arise, forage and lay 8 to 12 eggs. As the cycle progresses these young’uns leave mom’s nest to find their own nest for a winters night. The anthers of buzz-pollinated plant species are typically tubular. 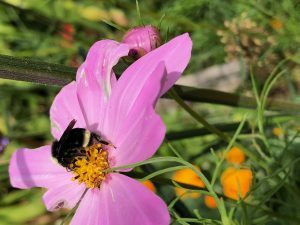 The bumble bee grabs onto the flower and moves their flight muscles rapidly, causing the flower and anthers to vibrate, dislodging the flower’s pollen. The buzzing sound is in the tone of middle C.
The honey bee, being a far more social insect, lives in colonies in various styles of hives from hollows in trees to man-made boxes. No matter the style of their house, the behavior of the bees remains constant throughout the year. From January until the Nectar Flow (typically blackberries in our region), the Queen strives to expand the colony to 50 – 60,000. The majority are Worker Bees, females, who conduct the work within and without the hive. Their first three weeks are consumed with in-hive duties. 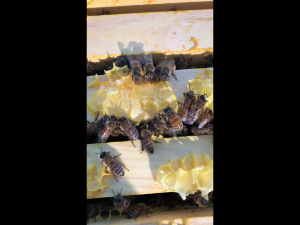 Cleaning cells, removing debris from the hive, removing dead bees, feeding the eggs and larvae, capping the brood, tending to the Queen (who requires feeding, cleaning, and such), and guarding the hive from intruders. This activity continues for half their life, about twenty-one days. It is in the latter half of the Worker’s life they leave the hive foraging for nectar, pollen, propolis (tree resin), and water. It is the flower’s nectar that drives the bee to the plant or flower. Nectar is a sugar-rich liquid emanating from the plant’s nectaries, either within the flowers or extrafloral nectaries. It is nature’s way to attract the honey bee for the sole purpose of having its pollen spread to other flowers. Nectar, approximately 70 to 80% water content, is mixed with the bee’s enzymes. When carried back to the hive it is transferred to Receiver Worker Bees who in turn store it in cells of honey comb. The Receivers add additional enzymes. The nectar is dehydrated down to 15 to 18% water content where it becomes honey, gold to humanity. The cells are capped with wax once it reaches the appropriate dehydrated state. Although the foraging honey bee is capable of flying up to five miles, this arduous exercise would soon render the forager without life. Once again, nature has provided an intricate set of behaviors to discern the best nectar location thus communicating this to other foragers. Scout Worker Bees arise at first light in search of the nectar source. Once found, they return to the colony to share their information with other foragers through the Waggle Dance. This simple exercise consisting of two concentric loops form a figure eight. It is the leg of the eight signifying the distance and the angle from the sun to the nectar source. As the day evolves, the bee is able to recompute the angle as the sun transverses the sky. von Frisch, an Austrian ethologist, received the Nobel Prize in Physiology or Medicine in 1973 for uncovering and describing the dance. It was not until the 1990’s that Dr. Thomas Seeley’s tireless observations uncovered the significance of this behavior. Although other issues are communicated, the dominate purpose is enticing Foraging Worker Bees to the nectar source. Next time you are out and about, put that electronic device aside, glancing about for the awesomeness of nature. There are many pollinators (ants, bats, beetles, birds, flies, moths, wasps as well as the honey bee). 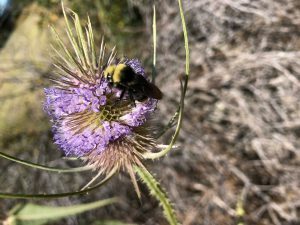 Oregon has eight to nine hundred native bees (leaf cutter, mason, bumble bee) aside from the honey bee. Admire their drive to sustain not only their respective species, but ours as well.